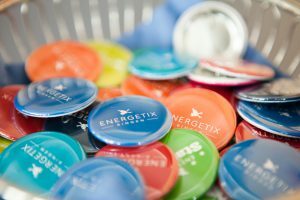 From the idea to the finished item: how is ENERGETIX’s catalogue produced? Who do those nice voices in Customer Support belong to? What happens in the warehouse and how does the highly modern engraving machine work? Around 50 business partners were able to gain an impression of their company for themselves on Friday. The brief introduction and a few items of news and information about the company were followed by a question-and-answer session with CIO / COO Alexander Link. And it’s precisely this direct contact that takes place at all ENERGETIX events that ENERGETIX business partners greatly appreciate. 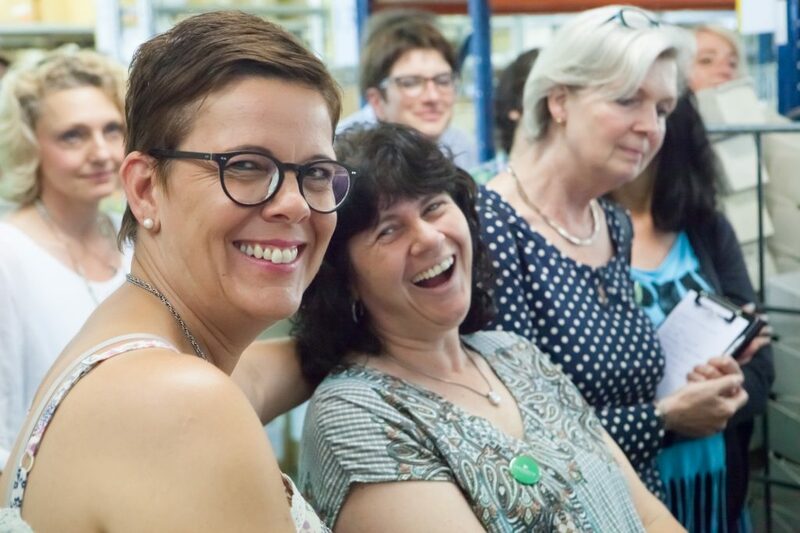 Members of the Bingen staff then accompanied the visitors on a tour of the premises and provided exclusive insights into the various departments’ working processes. Business partner Angela Schneider and her team thrilled with a creative song and guitar accompaniment. They had adapted the popular song ‘Tage wie diese’ (‘Days Like This’) by the Tote Hosen to their trip to Bingen and performed it together. Highly motivated, creative and in good spirits: Angela Schneider and her team surprised everybody with their song! 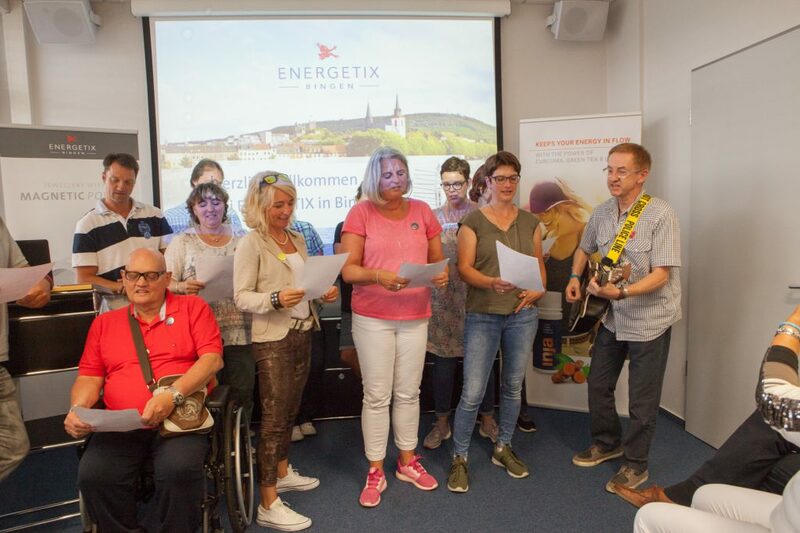 Things became very emotional when mentor Ulrich Lang – ENERGETIX man of the first hour and model for an exemplary career with ENERGETIX – suddenly turned up and further boosted spirits with his warmth. Informative and in a great mood: experiencing ENERGETIX up close! The participants were of course able to talk to each other about their experiences. This immensely important aspect is a must at any ENERGETIX event. Such an exchange will soon be taking place at international level at the annual Collection Premiere. The 15th anniversary in Berlin is certainly going to be a very special event – and something to really look forward to! The trip to Bingen was then rounded off by a boat trip on the River Rhine. This is how much fun work can be!The atmosphere was noticeably great: all business partners visibly enjoyed their day out in Bingen! 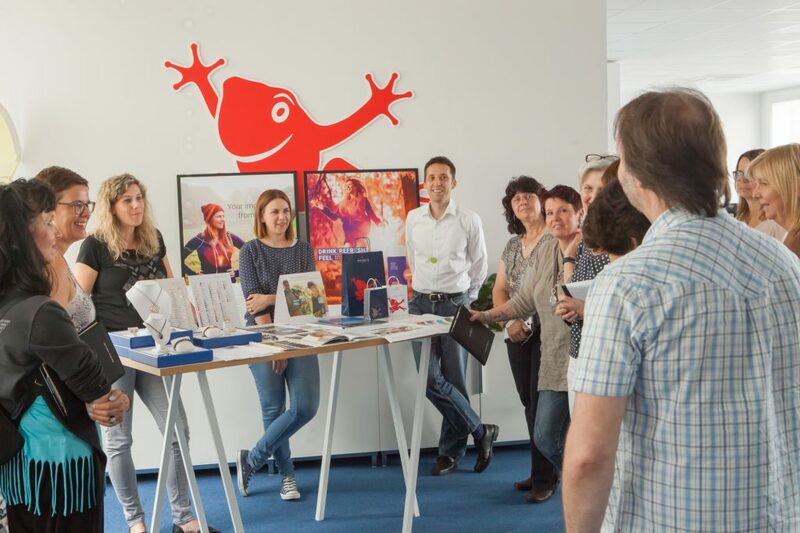 Business partners are always welcome to visit company headquarters in Bingen. Just get in touch with ENERGETIX’s Customer Support if you’re interested. Newcomers who qualify in one of the competitions are able to enjoy a two-day trip to ENERGETIX’s headquarters that is rounded off with an attractive accompanying programme! The event is so popular that even many of the ‘old hands’ would love to take part a second time. But trips to Bingen are only open to new business partners. This time to newcomers who had qualified in the LOVE YOUR BUSINESS and BE A STAR competitions. The prize is intended to give newcomers the opportunity to experience their company directly, meet the people behind the scenes, swap notes with others who are new to the business and connect with the management. Intensive exchange of experiences: the current winners, a 52-strong group, met on 22 June for an exclusive tour of the company in Bingen. The business partners from Germany, Belgium and Switzerland took the opportunity that the tour of the site’s departments offered to ask questions and make suggestions. With her 14 years of practical experience at markets and home parties, successful business partner Annette Becker-Boons, along with CMO Jessica Schlick, shared many valuable tried-and-tested practical tips with the participants on the first day. Questions about ENERGETIX and business with ENERGETIX were dealt with in detail just as happily as were the questions about the IT … which CIO / COO Alexander Link was glad to answer. Romantic sunset on the banks of the River Rhine: the first of the two newcomer days in Bingen came to an end with a delicious evening meal, emotional recognition of the newcomers and a lively party with tasty cocktails that was held on a roof terrace furnished with comfy lounge furniture. Shipshape, a good head for heights and a sense of enjoyment: the Friday was reserved for a joint team experience in the Niederwald. A boat outing to Assmannshausen, famous for its red wines, trips on chairlifts and cable cars with magnificent views across the Central Rhine Valley, a hiking tour with wine tasting and a concluding lunch in a secluded beer garden on the banks of the River Rhine created a nice mix of adventure and relaxation. The newcomers then departed for home with many positive impressions in their luggage. We wish all participants continued fun and success with ENERGETIX! You’ll find the photos of the newcomer event that took place on 22 and 23 June 2017 here.